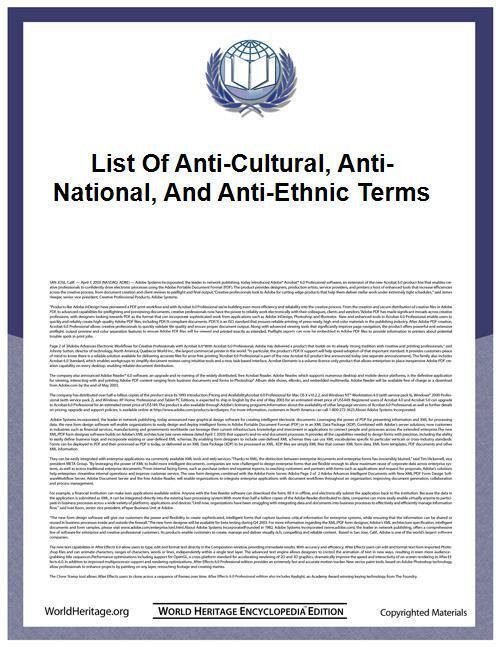 The following is a list of anti-cultural, anti-national, and anti-ethnic terms, where "anti-cultural" means sentiments of hostility towards a particular culture, "anti-national" refers to sentiments of hostility towards a particular state or other national administrative entity, and "anti-ethnic" refers to ethnic hatred or sentiments of hostility towards an ethnic group. The use of all of these terms is controversial, as they tend to be used prominently in local rhetorical appeals to fallacy —namely the natural confusion between politically directed opposition and ethnically directed hostility, often deliberately disregarding this distinction for propaganda purposes. These discriminatory attitudes are similar in nature to various religion-based hostile movements, such as Christianophobia and Anti-Catholicism, based on the mixture of xenophobia and ideological/political opposition. The linguist and activist Noam Chomsky noted that perhaps the original Western use of the term, from which all similar term originate, was by the Israelite King Ahab, in calling the prophet Elijah as "thou troubler of Israel." Chomsky further argues that such terms are similar in that they are used by nationalist and their associated governments to espouse the supremacy of nationalism over dissent within the culture, and are considered absurd in the context of cultures which have a much deeper connection to their ethnic history. While religion related phobias are formally defined as negative attitude to religion, also interpreted as attitudes to cultures associated with these religions. The suffix -phobia has gained popularity in its non-clinical use to refer to various negative attitudes. Albanophobia — fear, dislike or hatred of Albanians. Anglophobia — fear/dislike of England, English culture, Teutonic etc. Christophobia — fear, dislike and hatred of Christianity, Christians and things Christian. Francophobia — fear/dislike of the French. Hibernophobia - fear, dislike or hatred of the Irish. Islamophobia— fear, dislike and hatred of Islam, Muslims and things Islamic. Italophobia — fear or dislike of Italian people. Japanophobia or Nipponophobia — fear or hatred of the Japanese. Judeophobia — fear or hatred of Jews. Anti-Semitism relates to race, while Judeophobia to the religion. Polonophobia — fear/dislike of Poles, Polish culture, etc. Russophobia — a phobic attitude towards Russia or Russians. Serbophobia — fear, dislike or hatred of Serbs. Sinophobia — fear/dislike of the Chinese, Chinese culture, etc. Turkophobia — fear, dislike or hatred of Turks.